All this talk about another grand project by the Government in the form of a new airport at Tiavea – should they proceed – brings back memories. Not only does it remind us of a similar failed project out that way where millions of taxpayers’ tala were wasted, it also brings to mind a point made by a former Cabinet Minister which we should never forget. It has something to do with the Government needing to ensure aid monies are spent wisely. A few years ago, Samoa’s incumbent Trade Commissioner in New Zealand, Magele Mauiliu Magele, was the Minister of Education, Sports and Culture. Now it was the beginning of 2014 when he was speaking to more than 100 scholarship students in attendance, about the proper use of assistance from Samoa’s development partners. He urged the students to use their scholarships wisely, reminding about the sacrifices made by taxpayers of countries who are giving money to Samoa. “It is their sweat that is allowing you to go away to study,” Magele told the students, reminding them that many Australian and New Zealand men and women get up early in the morning, during the bitterly cold winters, to work. “They pay taxes and such taxes contribute to the scholarship funds allowing you to study,” the students were told. Magele urged the students to think about the generosity of the taxpayers of these countries. Magele’s words of wisdom are important. Leaders of today should always remember that, especially when it comes to grand projects created for legacy rather than necessity. Of course we accept that Magele was talking about students making use of the opportunities. But we can easily ask the same of the Government and how it is spending so many millions in aid. They have to make it count. It goes without saying that aid and foreign assistance have become the lifeblood of Samoa today. All you have to do is follow the news on a daily basis to know that without aid and foreign assistance from donor countries, development partners and Good Samaritans in general; the state of the economy would be in an absolute mess. Now they say there is no such thing as a free lunch. We have to consider this is in the context of aid to Samoa. 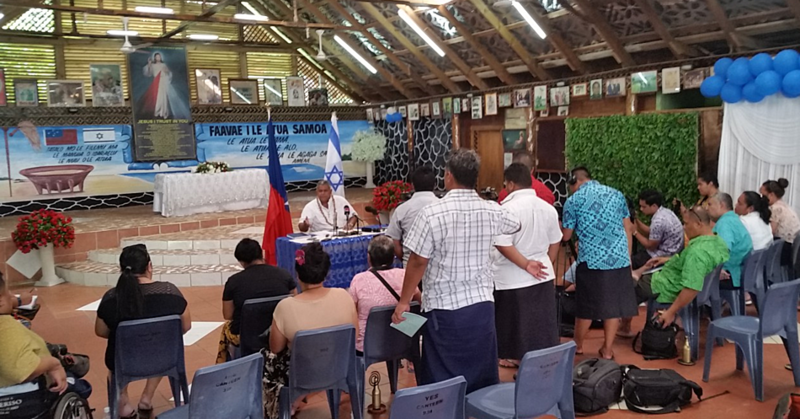 There are obviously vested interests – depending on who is giving – and of course there is a price Samoa has and will ultimately pay. Looking at the way some of these aid-funded projects and aid money has been wasted over the years, the question must be asked about whether the people in positions of power in Samoa today would do the same if that was money they earned from their sweat and tears. We doubt it. We ask this because millions of much-needed monies that should have been spent to improve the lives of people across the country have been sunk by the government into countless projects that were doomed to fail from the start. Think of the Satitoa Wharf for example. Think of many other white elephants around the country today. And now this Tiavea project. Who is the genius who continues to dream up these grand projects that end up being utter waste of public monies – let alone the sweat of other nations? Getting back to Magele’s point about aid, we must understand that “sweat” is bitter and unpleasant. Which means no one else has the right to rob another person off the fruits of such hard work. Our leaders of today must be reminded that aid is not free money they can abuse whenever, wherever. They should remember that there are women and children in those countries who are struggling to get by, simply because their governments made an honourable decision to share their wealth with others. The point is that Magele’s message to students back then in 2014 is extremely relevant to Samoa today. We continue to see how aid funding and public resources acquired through them are abused and mismanaged by the public service. We’ve said this before and we will say it again. It follows that greed and personal gain are things the leaders of this country must desist from. Greed, after all, is the root cause of evil since it promises material wealth way beyond our reach, which we therefore have no right to own. Have a great Tuesday Samoa, God bless!